�����New York, a jungle of steel and concrete. Where predators of all kinds mercilessly prey on all. Anytime, anywhere. �����In Central Park, U.S. Marine Captain Frank Castle enjoys a picnic with his family. On that day, the Castle family accidentally discovered a brutal mob killing. Fearing any witnesses, the killers gunned down the hapless family. On that day, Frank Castle�s family died. On that day Frank Castle died. �����On that day I was born. To avenge them, and others like them. I am the Punisher! If you�re guilty, you�re dead! --From the Genesis Punisher instruction manual. �����Fast-paced game action as every punk on the mean streets of New York City attacks you using guns, knives, clubs and bare fists. Although they come at you like rain from the sky, our Heroes, The Punisher and/or his favorite sidekick, Nick Fury, are prepared. Just be sure you are. �����The scenery graphics are somewhat disappointing; they are flat and without complexity or character. But this isn�t a travelogue, so you might not care or even notice. The main characters and the throw-away-thugs have some intricate detailing. You can even see Nick�s famous eye-patch. The background music is innocuous: you won�t put it on your I-Pod, but you won�t be annoyed by it either. The action sounds are excellent. You hear the fighters grunt, you hear their punches and kicks, gunfire is fabulous and grenade explosions are acceptable. There is breaking glass, screams and even Oriental vocal sounds in fight sequences. �����The first thing you'll probably want to do is go to Options on the title screen. You can change the controls so the Special Attack uses the C button instead of the A and B simultaneously. Of course, if you'd rather use the two-buttons method, that's up to you. 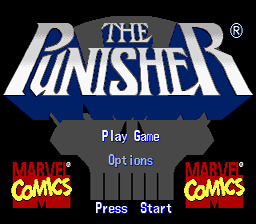 �����Single players can choose to be either The Punisher or Nick Fury. I couldn�t distinguish any differences between their fighting styles but you might. For those using the Two-Player Option, the only advice that I can give you is that you should work together. Duh! However, for those of you taking Lithium, there is the 2P Damage option which allows you to inflict harm against your partner. Tell me how that works out from your hospital bed. �����Pick up fighting weapons as you go along, and use them. They disappear quickly if they are not picked up. You can grab plants, chairs, etc. and use them as weapons. You also can grab an enemy and throw him into other enemies. Grab the money and anything else that has value. Eat the food as it is found to regain strength. You can pickup valuables, which have point values, but there is no mention of what you do with them once you have them.